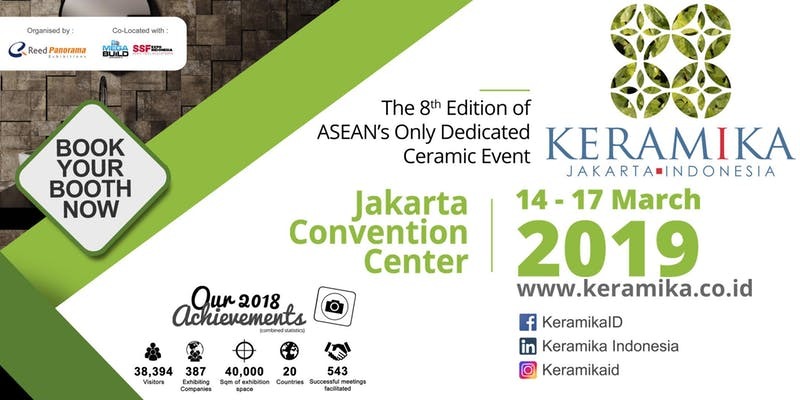 Returning for its eighth edition, KERAMIKA continue to be the dedicated marketplace for the ASEAN ceramics industry to congregate in the largest ceramic producing country in ASEAN and one of the largest ceramic consumers in the world, Indonesia. ASAKI - The Indonesia Ceramic Industry Association will showcase top Indonesia ceramic manufacturers in KERAMIKA and feature the latest design and technology of Indonesia Ceramic Manufacturers. 1. WORLD OF TECHNOLOGY – Keramika 2019 will feature over 100 exhibitors covering the entire ceramic manufacturing industry covering raw materials, equipment, technology, solutions, supplies, and finishing to over 10,000 ceramic industry professionals from the ASEAN region. 2. WORLD OF CERAMICS – Keramika 2019 will showcase the new launches, design and solution from Indonesia Ceramic Industry Association (ASAKI) manufacturers, bringing the best in class into the exclusive World of Ceramics zone in Keramika 2019. The event is co-located with Indonesia largest building materials show – Mega Build Indonesia 2019. As part of exhibition, KERAMIKA 2019 will provide world class conference that will be hosted by The Indonesian Ceramic Industry association (ASAKI) and ACIMAC (Italian Association of Ceramic Machinery and Equipment).